This book is available through the Los Angeles Forum for Architecture and Urban Design's website. This book is not yet available at Amazon. In Every Dream Home a Heartache, By Roxy Music, 1973. I started out my career in architecture as a designer with a corporate firm in Washington D.C. that specialized in office parks, many of which were located in the rapidly developing Reston/Dulles Corridor of Northern Virginia. The experience, which only lasted 6 months, left me so cynical towards both corporate developers and the architects who serve them that I quit and went to work for another Virginia firm that focused on assisted living. What I learned during my short tenure at that firm was that the development industry has neither an emotional attachment towards the social implications of the built environment, nor does it care for the utopian projections which began with the modern movement- both sentiments that are drilled into architects brains during their first year of design education. Instead, developers have learned to harness what architects typically eschew- society’s fondness for nostalgia and predictability, as well as an ability to conveniently ignore the implications of the environmental damage caused by suburban development. 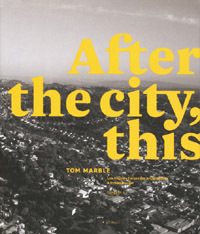 Enter After The City, This (Is How We Live), a clever, exploratory pamphlet by Los Angeles architect, Tom Marble. Supported by the Los Angeles Forum for Architecture and Urban Design, After the city, (this is how we live) cloaks itself in the guise of a Hollywood script weaving a story that is both educational as it is entertaining. Marble seeks to unravel the why behind all of those “little boxes on the hillside”, how they got there, and the men who made them. Hollywood has long been infatuated with the suburbs, often portraying them as hotbeds of banal consumption juxtaposed with the prospect of illicit activities which often occur behind the carefully manicured hedgerows and modest facades. However, while many script writers have explored the psychology and sociology behind suburban living, few have sought to uncover the larger processes that gave us the suburbs in the first place. Using disillusioned architect Nathaniel Flemming as his tragic hero, Marble populates his story with a flock of vapid characters, whom at best, are two dimensional representations of their real- world counterparts. The developers I’ve met are far more complex than the individuals depicted in Marble’s story, though this may meet the standards of cinema, a business where the actor is expected to supplement what the writer leaves out. His plot borrows character types from L.A.’s own film noir legacy as well as inserting local architect superstars Eric Owen Moss and Frank Gehry, as well as urban theorist Norman Klein into the mix for authenticity. However, the overarching goal of After The City, This (Is How We Live) is not to paint Boschian portraits of the evil developer and his automaton minions, but to use them as a vehicle in order to teach the reader about the technical processes that are inherent in large scale commercial and residential development. Covering all scales of subjects from land entitlements to stucco details, Marble crafts a handbook for deciphering the contemporary development project. The narrative of the script is complimented by a bank of images which populate the latter half of the book and seek to inform us about how cynical and ruthlessly systematic the world of development can be. Some of the images are a bit scatological, but this can be overlooked when one combines them with the text, a feat easily accomplished by Juliet Bellocq’s restrained and calculated graphic design. What results is an additional narrative overlay which only emphasizes the pathos unfolding in the cinematic plot that Marble has devised. I’ve never been a fan of reading scripts and was initially skeptical of Tom Marble’s delivery method for the book. However, when I recently read it on a flight from Los Angeles (or "Ellay" as the characters in the book call it) to Florida, I couldn’t put it down. Marble uses all the predictable hooks and stereotypical characters found in traditional cinematic fiction and yet manages to hold your attention by mixing the lurid details of his characters daily lives with the esoteric minutia embedded in the development industry. The result being that the reader is both entertained and educated, which is exactly what one might wish of a project such as this. After The City, This (Is How We Live) has few faults and my only general criticism would be that Marble neglects to really uncover the larger realities of the system that created the development industry. Real estate is predicated on the consumers quest for predictability and security, but it is also much more. In the world of capitalism property is a representation of the larger territory of global production, with real estate serving as a place holder for the temporal flows of capital itself. This means that it is a mere mirage of the system, not the actual machine. It is this concept that the characters of the book are not able to illustrate, possibly because of the excessive scope of such a task. As my plane flew back to Los Angeles I picked up After The City, This (Is How We Live) again, scanning the story this time to pick up pieces of detail or plotlines I’d missed before. After reading the texts’ climatic ending for one last time I put the book back into my carryon, choosing instead to gaze out the window at the Mojave Desert some 28,000 feet below the aircraft. We were closing in on the L.A. metropolitan area and the brown smear of desert was giving way to the rocky peaks of the San Bernandino Mountains and the equally brown haze of urbanity beyond. Below me Federally protected wilderness was giving way to the threads of civilization as forest and canyon parted for freeway and suburb. I squinted down at the emerging sprawl of cul de sacs, strip malls, and single family homes that make up the Eastern San Gabriel Valley, knowing why they were there, how they arrived, and that there would be more.